Membership in the National Council for Home Safety and Security is available to qualified companies and individuals, based on meeting our membership guidelines and agreeing to our code of ethics. 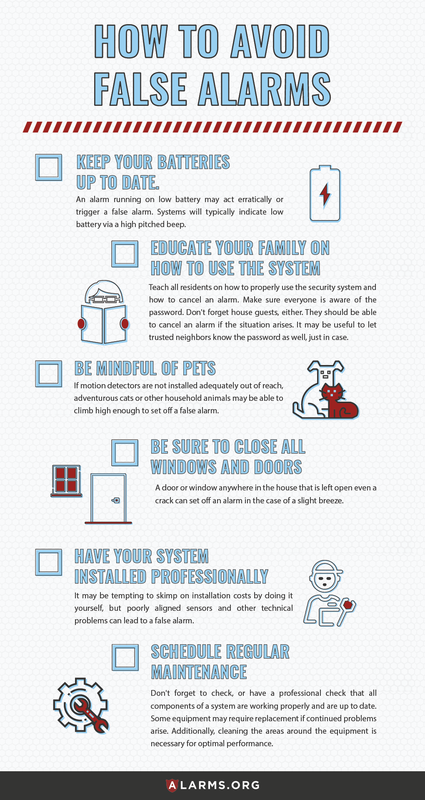 Home invasions are notoriously difficult crimes to solve, and homeowners are encouraged to take preventative action by installing a home security system. Despite varying considerably in both cost and function, home security systems are a proven means of averting burglary, keeping both residents and valuables safe. A 2009 Rutgers University study concluded that in Newark, NJ from 2001 to 2005, burglaries decreased significantly with an increase in the number of registered home burglar alarms, with the added bonus of lowering the risk of home invasion for neighbors and rendering communities safer, at large. Unfortunately, many people underestimate the likelihood of their home(s) being burglarized, or are put off by the cost of home security installation, and many preventable crimes continue to be committed. One such incident occurred in October 2016, when the home of Thomas Harty of Orange, Massachusetts was invaded by two criminals, who violently assaulted both Harty and his wife, Joanna Fisher, resulting in their deaths. Northwestern District Attorney David Sullivan recalled Fisher’s story, told to him while she was suffering in the hospital, Fisher explained that she and her husband were “watching television when a pair of suspects invaded their home, launched a savage attack and fled with credit cards, cash, and the couple’s 2003 Toyota station wagon.” While such cases are uncommon, they are also preventable, and further demonstrate the need for a home security system. 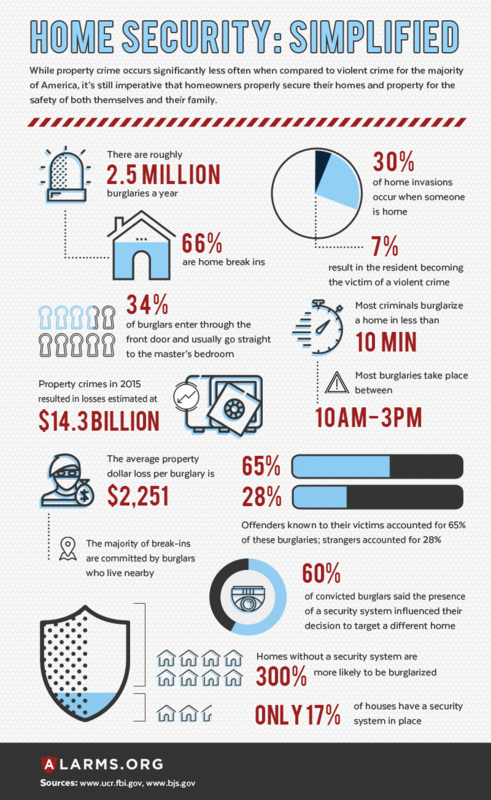 While every home carries some risk of being robbed, and it is difficult to predict which homes are most susceptible, there are certain trends and statistics that indicate to a homeowner whether his or her home has an outsized risk of being burglarized. Some of these are common sense, like the fact that homes in high crime areas are more likely to be invaded, whereas others may be surprising. For example, you may assume that higher income households and the valuables--large televisions, jewelry, cash, etc--that go along with them are at a higher risk of being burglarized, however the frequency of home burglary for higher income households is typically lower than that of lower income households. Furthermore, the most at risk households are those containing a single parent and children and the most frequently invaded type of home is a mobile home. This runs contrary to the notion that thieves methodically case out and clean the homes of the wealthy, however that isn’t to say that those of the middle class and higher income brackets aren’t at risk of a home invasion. A home with weak entry points (old doors, windows without locks) or valuables on display, like a large flatscreen tv set easily seen through the front window, are more likely to be invaded. Perhaps the most avoidable risk factor is the absence of a home security system. The first modern home security system was invented in 1966 by Marie Van Brittan Brown and her husband Albert of Jamaica, Queens. Brown and her spouse were tired of feeling vulnerable in their crime-riddled neighborhood and in order to combat their fear and prevent home invasion, they dedicated countless off-hours to designing and installing the a closed-circuit television security system. Surprisingly, few attempts at a similar system were made before Brown’s, and she is often credited as a pioneer in the field of home security. With the steady increase in violent crime and home invasion during the 1960’s and 70’s, installation of home security systems became widespread and commonplace. Today, the technology behind them has become more effective and sophisticated. A wide variety of home security systems are now available to fit the specific needs of each respective homeowner and/or business. Motion sensors are widely used, in which the motion of something large enough will trigger an alarm and alert system. There are two types of motion sensors – passive and active, of which passive is far more common in home security situations. Active motion sensors operate by sending and reflecting ultrasonic wavelengths in a pattern throughout an area. If the pattern is disturbed by something significant, like a person, the motion sensor can be set to sound an alarm, send an alert, or both. Infrared motion detectors read heat given off by humans, animals, and even appliances. These systems, when a sudden rise of heat is detected (like that emitted from a human) will sound an alarm. Fortunately, this alarm ignores minor heat fluctuations, like the subtle rise of household temperature due to the sun setting and rising. Photo sensor motion detectors utilize light beams or lasers to map an area. If the light pattern is disrupted, the system will detect it and sound an immediate alarm. Of course, these are the most common and effective systems, but there are also systems considered unusual and even strange. One such system emits light that mimics that of a television, making the house appear occupied and therefore less likely to be invaded. Window alarm sensors are installed and send an alert to both your personal system and the police that there’s suspicious - possibly criminal - activity taking place. There are several different models of window (and door) alarms and they can be both wired and wireless. While there are many different kinds, the most commonly used (with the best results) include but are not limited to vented window sensors, surface contact sensors, and garage door contact sensors. Security systems can be understood to fall under two principal categories: monitored, which send information and video footage to a central office, and unmonitored, which is connected to an alarm system installed within your home. Whether you opt for a monitored or unmonitored system mainly depends on how much you are willing and able to spend on home security. Monitored systems nearly always come with a monthly fee, yet with the added comfort that professionals are watching over your home twenty four hours of the day. A tripped signal will send an alert to your security company that there is an unauthorized person in the home, and they will immediately contact you with this information. If you are not reachable, local authorities will be notified of possible intruders in the home. Alternatively, unmonitored systems are much cheaper, though they are not linked back to the home security company’s central office. Police can still be linked to this type of system, though this comes with the added risk of false alarms and unnecessary calls to authorities. In the case that there is no phone link to authorities at all, loud alarms and bright lights be activated in the case of an intrusion, alerting neighbors who will hopefully do you a solid and call the cops. Choosing between a wired or wireless surveillance system depends on the individual needs of a homeowner. Each comes with its advantages and disadvantages. In short, wired systems are more reliable but come with added difficulties in installation. Wireless systems pose a greater risk of failure, yet are simpler to install and are more flexible in their potential positioning. It is important to consider the benefits and drawbacks of both before making a decision. Wireless surveillance cameras come in many different shapes and sizes, and the recommended amount to have installed in one area is four. Each camera must be connected to both the receiver (phone, laptop, television) and some sort of power (generally batteries). The most commonly used is a type of wireless camera that connects to a smartphone or computer, making viewing all angles of a home significantly more efficient and accessible vs. a classic television monitoring set. Television monitoring sets are, however, greatly utilized in more industrial aspects of security. Wired surveillance systems have been the standard for much of the history of home security, however with steadily advancing technology, many opt to go wireless. Despite recent trends, wired surveillance cameras still typically provide higher resolution compared to the wireless variety. Additionally, they are more reliable, as wireless systems are more prone to hacking and signal inference. Yet, there are disadvantages to wired systems as well. Wired systems require a more complicated installation process, with bulky components and a number of cords to route around the home. Because every home and the needs of the homeowner are different, there are many different versions of each system, and these can usually be installed by a professional, or if preferred, independently. Systems that are relatively simple can be installed by homeowners themselves with ease, while it is recommended that more complex systems be installed by a professional. Certain systems can be installed in various places throughout a home. The most important places to secure are doors and windows, ensuring both the locks and seals are reliable. Then, cameras or motion sensors should be implemented in other key places that allow for the best visibility or detection range so the home is as secure as possible and visually accessible to the owner through whichever device is chosen. It is crucial to install the sound source at a central location where it can be heard by all inhabitants of the home. Home security systems can cost anywhere from $20 to $2,000 but typically cost between $250 to $1000 depending on the needs of a home owner and the investment one is willing to make. Taking into consideration production costs, shipping, installation, and the quality of the product, it's likely that an effective system will come at a price. Investing in a system that will function properly and last several years is far more important than a short-term fix, as nothing is more important than keeping the home and family safe. A basic, bare bones system will consist of a few door or window sensors, a motion sensor and a control panel and may only be monitored via a landline rather than through the internet or a cellular network. This type of monitoring is cheaper, yet there is always the risk that a thief will cut the phone line, rendering the system useless. One can expect to pay $10-$30 a month for a system of this nature, along with possible equipment and installation fees. Protect America’s Copper Plan is one of the most affordable on the market at 19.99 a month with a 36 month locked-in contract. The system includes one Simon XT panel, three door/window sensors, and one motion sensor. A lifetime warranty is included in the plan, so if any of the components happen to fail, Protect America will replace it without cost. The system is pretty rudimentary and monitoring can only be done through a landline phone, rather than a cell phone, but it is an all around decent system that won’t break the bank. Higher end systems may include additional motion sensors and greater protection against attempts to destroy or disable the control panel or other system components. They also offer cellular monitoring, which allows a homeowner to monitor his or home from a cell phone via a cellular network. These types of systems will run you 30-60 dollars a month and additional equipment/installation fees that vary from plan to plan. Occasionally, sales agents will claim to represent your current security company and arrive with the supposed intent to fix or update your existing system. After being invited in, they will install an entirely new security system and have you sign a new contract with inflated prices. Beware any agent offering a “limited time” deal or one with “free” equipment. Likely, there are unspoken expenses involved, or the contract is long term and different to break. They may attempt to frighten you into having a system installed with bogus claims of heightened crime in the neighborhood or a rash of burglaries nearby. Worst case scenario: The “agent” is actually a criminal and will use any excuse possible to be invited into your home to disable your security system in order to burglarize your home at a later date. The best way to avoid these types of scams is to be scrupulous and skeptical. Demand to see the representative’s paperwork and credentials before any serious consideration towards signing a deal with them. Also, always ask for references, including the names of customers in the neighborhood. In general, it's always preferable to call and arrange an appointment with a home security company by yourself rather than to agree to a deal with a door-to-door sale agent.